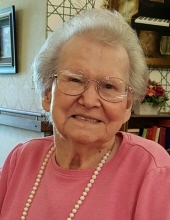 Helen M. Dean of Rolla, Missouri passed away Wednesday, March, 20, 2019 at the age of 101 years. Helen was born September 28, 1917 in Phelps County, Missouri to Benjamin and Julia Ponzer. Helen married Charles P. Dean September 6, 1939 in Rolla, Missouri. Helen was a great homemaker and an exceptional cook, loving wife, mother, grandmother, great grandmother, great great grandmother, and sister. Helen was a very caring person and always enjoyed caring for her family and friends. Charles and Helen operated the family farm adjacent to Big Dry Fork creek until retirement where they always raised a big garden and Helen enjoyed canning fruit and vegetables to share with her family and friends. Helen was a member of St. Patrick Catholic Church in Rolla for many years. Helen was preceded in death by her husband, Charles P. Dean, one son Robert J. “Bob” Dean, two daughters-in-law, Eileen K. Dean and Linda J. Dean, her parents, Benjamin and Julia Ponzer, brothers, Benjamin Ponzer, Franz Ponzer, and John Ponzer, sisters, Catherine Horn, Pauline Willy, Josephine Rogers, Viola Herberger, Loretta Bouchard and Rose Ponzer. Helen will be missed greatly by her surviving family which includes her two sons, Charles L. “Bud” Dean of Rolla, Missouri, and William P. “Bill” Dean and wife Carole of Cuba, Missouri, and one daughter, Mary E. Jensen and husband Erik of Springfield, Missouri, one daughter-in-law, Alice M. Dean of Humble Texas, five grandchildren, Susan A. Scherer and husband Keith, Brian C. Dean and wife Sharon, Wyatt P. Dean, Eric F. Dean and wife Selva, and Matthew C. Dean and wife Sarah. Five great grandchildren, Stephanie L. Scherer, Andrew P. Scherer, Brady C. Dean, Garrett D. Dean and wife Alexis, and Mattie L. Dean, two great great grandchildren, Cooper Dean and Allee Dean, two brothers, George Ponzer and Henry Ponzer, and one sister, Imelda Martin, and many nephews, nieces and friends. A funeral service for Helen M. Dean will be conducted at 1 p.m. on Monday, March 25, 2019 at the Null and Son Funeral Home in Rolla. Interment will follow in the Rolla City Cemetery. A visitation for family and friends will be held prior to the service Monday beginning at 11 a.m. at the funeral home. Memorial contributions are suggested to St. Patrick Catholic Church. To send flowers or a remembrance gift to the family of Helen Mary Dean, please visit our Tribute Store. "Email Address" would like to share the life celebration of Helen Mary Dean. Click on the "link" to go to share a favorite memory or leave a condolence message for the family.